Luteolin is a common flavonoid that exists in many types of plants including fruits, vegetables, and medicinal herbs. 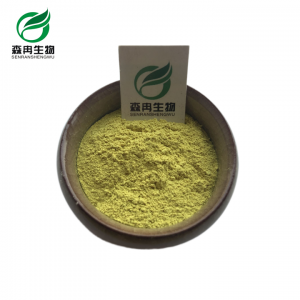 Plants rich in luteolin have been used in Chinese traditional medicine for treating various diseases such as hypertension, inflammatory disorders, and cancer. Having multiple biological effects such as anti-inflammation, anti-allergy and anticancer, luteolin functions as either an antioxidant or a pro-oxidant biochemically. The biological effects of luteolin could be functionally related to each other. For instance, the anti-inflammatory activity may be linked to its anticancer property. 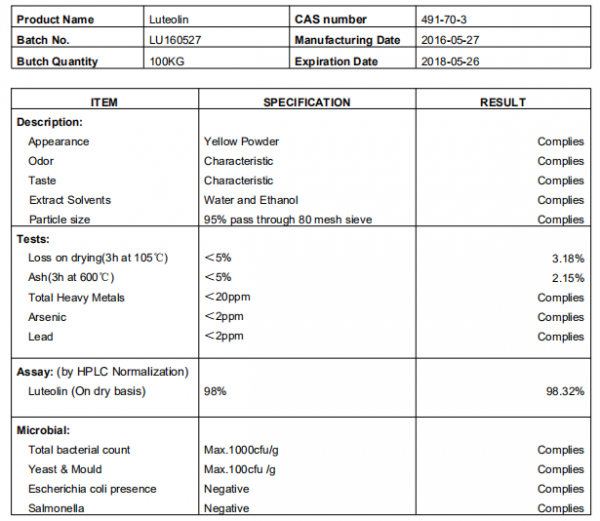 Luteolin interferes with nearly all types of cancer cells. It inhibits the growth of new blood vessels in tumors, the metabolism of carcinogens, as well as stopping the progression of the cell cycle in cancer cells. Luteolin also induces cell death in cancer cells. Luteolin is also found to suppress two major pathways involved in response to inflammation, which greatly reduces both acute and chronic inflammation. Luteolin is an oxygen scavenger. It was found to inhibit reactive oxygen species, which induce damage of lipids, DNA, and protein. Luteolin significantly induces genes related to antioxidant defense. Luteolin potently inhibited UVB-induced MMP-1 expression and wrinkle formation in vitro and in vivo and therefore may be used for prevention of UVB-induced skin aging. Luteolin substantially increased cell life while reducing evidence of oxidative stress-induced damage in the cells. Luteolin also improved the recovery of heart cells contracting function following simulated injury caused by loss of blood flow, by reducing oxidative stress. Luteolin induces neurite outgrowth through CREB activation. CREB activation is the mechanism underlying its effects on memory enhancement. Luteolin can go through the blood-brain-barrier (BBB), which shows anti-amnesic effects against the toxicity of amyloid in mice. Luteolin was found to have potent antiviral activity against Japanese encephalitis virus (JEV). In mice with hepatitis B virus (HBV), Luteolin reduced HBV DNA replication, suggesting that it may be used for anti-HBV therapy. In rats, luteolin enhanced the antioxidant potential and lowered the oxidative damage to the lens’ of rats in selenite-induced cataracts. It also improved the membrane integrity of the lens. Latin Name Arachis hypogaea L.